Sophomore guard Russell Westbrook scored 19 points, grabbed 7 rebounds, and dished out 8 assists to lead UCLA (7-0) to a 83-60 thrashing of George Washington before a crowd of 9,691 at Pauley Pavilion. Westbrook seemed more relaxed on the court in this game, yet and at the same time was more aggressive on offense attacking the seams of the Colonial's zone defense for inside shots or dishes to open teammates. Perhaps the reason for Westbrook's play was the return of preseason All-American point-guard Darren Collison who came off the bench to play a surprisingly long 26 minutes in the game. With Collison on the floor, Westbrook moved back to his natural spot at the two, and with the burden of running the offense off his shoulders, he was able to get back to the strength of his game, mainly creating offense with his speed and incredible athleticism. Just as impressive, Westbrook was a perfect 9 of 9 from the charity stripe. Collison, playing in his first game of the regular season after spraining the MCL of his left knee on November 2nd, finished with 14 points on 4 of 9 shooting and 5 assists. He wore a protective brace on his knee. At first Collison started off slowly, and seemed tentative jumping off his left leg, but as the game continued he increasingly gained confidence in his play and ability to move on the court, he even took some off-balance shots which landed him on the floor a few times as his coaches and Pauley fans winced with every fall. 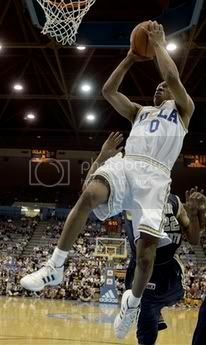 "He made a big jump," UCLA Coach Ben Howland said. "Now he's playing out there not thinking about the injury anymore. It's incredible how he played after he'd not done anything in 24 days and not having played a game for 26 days." George Washington was able to stay with UCLA for most of the first half with some timely three-point shooting while on defense their press and zone gave the Bruins some difficulty. UCLA went into the half with just a 44-35 lead. The Colonial's zone defense sagged down to suffocate Bruin freshman Kevin Love who only managed 2 of 4 from the field but he still managed to record another double with 11 points and 11 rebounds despite GW defenders grabbing and mugging him whenever he went into the post. In future games, Love's teammates need to do a better job finding him in the high post when opponents sag down inside on him, to give Love some relief and to also take advantage of his passing and shooting ability. The Bruin's grinding, physical play eventually took its toll on their opponent in the second-half as George Washington scored only 25 points on a meager 32% shooting. UCLA was also more effective in attacking George Washington's defense after halftime. Junior Josh Shipp added 15 points on 6-12 shooting including two three-pointers early in the second-half to help the Bruins pull away in the game for good. "We really did a good job in the second half, coming out and attacking the press," Howland said. "I was especially pleased with Westbrook's penetration to a jump stop to kicking it back out. He hit Josh for those two threes in a row." Despite facing a pressing team, the Bruins committed only 10 turnovers. Collison had zero turnovers in his return. On the other side, UCLA's own pressure halfcourt defense forced the Colonials into 19 giveaways. Alfred Aboya, who fractured a bone below his eye in the game against Yale, started at power forward wearing bright yellow goggles to protect his injury. He was 3 of 4 from the field before fouling out late in the game. He complained of some headaches during the game as a result of playing with the goggles. UCLA will now face the No.8 ranked Texas Longhorns on Sunday at Pauley Pavilion in the inaugural Big-12/Pacific-10 Hardwood Challenge. Great win and now looking forward to another great match-up against Texas this weekend. What were some of those early nay-sayers saying about UCLA's "soft" schedule earlier in the year? I think up to this point, UCLA will be the only team (or only one of a couple) to have faced TWO top ten teams in this early season. They better get their 3pt defense in order because Texas can score 50 points in about 5 minutes. They rain 3s. Should be fun. Does anybody know how to get these games over the internet? Tape delayed is okay with me. Hey Me, try this link as tip-off gets closer. You need to create a user profile at bruinville.com first. Is this live and/or on-demand streaming video of the basketball games? or is this just highlights? How is this different from UCLA All Access which offers only a couple games via video on the Internet? Thx. Curious. Is George Washington a quality university (i.e. Georgetown)? What I mean to say, and I hate to throw stones, but the few GW fans I encountered at Pauley last night were rude and lacked any class. Their speech was profanity-laced and they strutted around as if they wanted confrontation. I've met West Virginia, Michgian fans, and they were terrific. But GW fans? Last night made me wonder about that college. I hope our UCLA fans are better behaved when they go on road trips to other schools. Have you considered getting DIRECTV? Most home games are on Fox Sports Prime Ticket(FSPT) channel 653. I've tried several cable services & dish network, DIRECTV has been the best for me for sports programming, customer service and price, also they have the amazing NFL package! No I don't work for DIRECTV! Mata-Real is the man and K-Love will bounce back strong against Texas! As someone who grew up in DC and now goes to UCLA, the general attitude in DC is that G'town would compare to UCLA, wheras GW would compare to USC (although probably slightly more positive.) So yes, GW's a pretty good school, but not a great one. Glad to hear that the GW fans I ran into at Pauley were more the exception. I guess there will always be those bad apples in the crowd - even among Bruins fans. Mbah, it looks like you didn't listen to me....the way you are playing, you are coming back next year...step up your game "sleep-walker"
I sat close to the court for this game...Mata's calfs are the size of tree trunks...geez! Texas is gonna get HOOKED Sunday!! As a UCLA alum now going to GW for graduate school I can certainly note that the ones you encountered at Pauley were bad seeds. The majority of people I've encountered to date here have been friendly and welcoming as opposed to crass, vulgar and Trojan like. The school has a very good combination of academics, great graduate level programs and fantastic location in one of the nice areas of DC! It goes to show you that every student and alumnus is an ambassador when they wear their school colors to other campuses. I know I wear my U-C-L-A colors proudly. Can't get the games via dish network or directv as I am overseas. Only way to watch the games is via Internet. Try to find where I can get the games!!! The games at Bruinville are "streaming video" and a chat (with other Bruin fans) can be had at the same time. There are a few fans in various parts of the country as well as overseas which are way pleased with the way Bruinville brings the games to them. I forgot to mention that at Bruinville sometimes videos of games are posted (avi format). These videos are found in the "multimedia" section of Bruinville. When are the game schedules set up? I was just looking at SC's schedule and they have a home game against Kansas (#4) and an away game against Memphis (#3). Are non conference games scheduled over the summer or even earlier? Correction: The Memphis game is one a neutral site. In any case, why did then schedule such high ranked teams? FYI, those games were scheduled assuming they would have retained a player or two from going pro. The schedules are finalized in the summer prior to each season. Teams can certainly be scheduled months before the schedule is released. In other cases, like the UCLA-Michigan series a contract between the schools specifying a number of home-away games are worked out. The Bruins recently completed a two year home-away with West Virginia. As for USC, Tim Floyd was recently quoted as saying that he scheduled a tough schedule because USC is trying to build a national reputation and get some coverage in order to attract better players to the program. UCLA does not need to do this, they are already a powerhouse, an elite program that can pick and choose their schedule. As it turns out, those who figured UCLA was playing a cupcake non-conference have been proven wrong again with the Bruins playing two top ten opponents within the last couple of weeks. Texas game very well may be the most difficult game of the season, if we wrap that up successfully, we have the #1 seed locked up for the season (assuming we don't falter in some conference games). Thanks for the info, BBR.